I was supposed to visit Yang at school. I invited Cleopatra and Scooter along, and we were going to hangout with Yang and get ice cream sandwiches, but with doughnuts!! And then Mom all of a sudden was like, uh, no you can’t drive that far. Gee, thanks for the last minute notice. I ranted for an hour to Yang (keep in mind that this was going on at 1am while I was pacing outside my dorm) and we tried to come up with a solution (Cleopatra could drive! But her parents wouldn’t let her either. Scooter could drive! But her car was in the shop. We could take Amtrak! But that’s $35 each way. My dad could drive us! Hah yeah right), but eventually we just called it off. Instead, I’m sleeping over at Yang’s and we’re having midnight spinach and sun-dried tomato quiche with toasted sesame crust!! This is why we’re friends. I threw out a bunch of suggestions at Yang- cake, muffins, pie, quiche, custard, etc. She latched onto pie, but her family doesn’t eat pie, so we went with quiche. I was listening to America’s Test Kitchen Radio #405 (“Quack Diets?”), and one guy called in with a question about the reasoning behind creating a well in dry ingredients and adding in the wet. Bridget and Chris said that it was probably unnecessary, and meant to prevent the first reaction (did you know that baking powder is double acting and that it reacts during mixing and baking?) from happening before the baker wanted it to. This was because ovens were less reliable than they are now, and the baker needed to preserve the lift until as late as possible before popping it into the oven. TL;DR; Don’t worry about creating a well in your dry ingredients. We used black sesame seeds, since we didn’t have any other kind, but it was fine. Yang wanted to make buttermilk, so we did with some 1% milk her mom wanted us to help use up. I forgot to sprinkle the pan with sesame seeds, but it was still yummy/pretty/didn’t stick to pan. The crust was baked for 10 minutes with foil, and then 5 minutes without the foil to encourage browning. It didn’t get much more color, but it did dry and crisp up more. There was a big air bubble on the bottom when we pulled it out the second time, though luckily it deflated immediately. The crust shrunk to 3/4 of its original height, and any attempt to push it up with the back of a fork didn’t work because it was already set at 10 minutes. This was kind of annoying, since I didn’t think I stretched the dough and I’m not sure why it shrunk; also because we knew we would have to make mini ones and dirty another pan. The onion for the filling was cooked until it was browned, not caramelized. We were lazy (and it was 12:30am at this point), so we cranked up the heat and kind of seared/charred the onion. Eh, it works. We used frozen spinach; it still wasn’t defrosted after an hour at room temp, so we defrosted the frozen spinach ice in the pan (my plan was to wring out the water beforehand, but this worked out well anyways). I accidentally added the tomato oil while trying to pour tomatoes out of jar and into pan. It made the filling kind of oily and hard to tell if the liquid in the pan was oil or water (we realized it was water when it refused to move. We used mozzarella instead of havarti out of personal preference. We also cut down on the cheese; originally there was 3/4 cup cheddar, but we toned it down to 1/2 cup, and omitted the gruyere. Tieghan (of Half Baked Harvest) is known for her cheese obsession, and while I support that, I think midnight snacks need to be a teensy bit healthier than an onslaught of pastry and butter and cheese. And I love gruyere, but we didn’t want to include it because we spent $18 on a block of cheddar, a log of mozz, a brick of cream cheese (for cheesecake), a jar of sun-dried tomatoes and frozen spinach; adding gruyere would have made it more expensive for a quiche that already has no place being made by college students. We mixed the filling by hand instead of a blender, because it’s really not necessary. And I hate washing blenders. Because of the crust shrinkage, we had too much filling and custard. We made 9 mini quiches in a greased muffin pan without crust. And Yang didn’t want prosciutto (or bacon) in the quiche. Who knows why. So we omitted that. We baked the big quiche for 50 minutes at 350F. Yang’s oven is weird, and you can’t change the temperature after you set it once. Also, we were using a 10” pan, so it was thinner. The small ones were in for 15ish minutes. It was kind of liquidy when we tested it, but we were afraid of overbaking it, so we just let it carryover cook for a bit in the pan. The crust was tough; it was a job to try to cut through it. Maybe we kneaded it too much? I don’t think so, especially because it wasn’t cohesive for a long time and all the kneading we did was necessary. And we didn’t use that much extra flour to dust the work surface/rolling pin. And there’s a fair amount of butter in there. Who knows. The bottom wasn’t hard, nor was it soggy; it just kind of disappeared. The flavor was really great though- it was very toasty, like Asian sesame crackers. I wonder what would happen if those crackers got ground down and mixed with melted butter, then patted into the pan for the crust. The filling was yummy. We should have cut up the tomatoes more (they were julienned by the manufacturer), since a bite of tomato was a bit potent when the eater got one. I loved all the spinach, and the onions melted into the custard so beautifully. I think some garlic would be fantastic in here to add more oomph to the allium section. There was so much cheese that you would hit a cheese bank and come out with a huge strand. 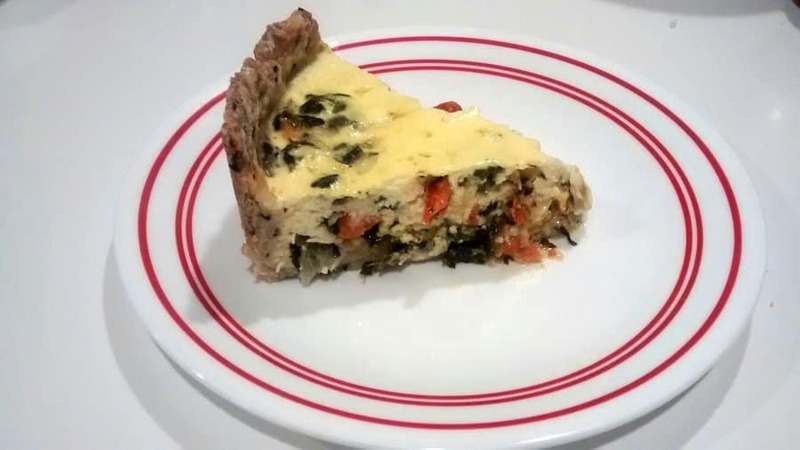 Nothing wrong with this, but I think redistributing some of the cheese from the filling to the top of the quiche would add more depth: you’d get a prettier top with bubbly browned cheese, and if you get some of the cheese on the crust, you could end up with frico’d crust!! The custard in the little ones were a bit over (we didn’t put that much custard in them, and they were mostly filling), but the big quiche was perfectly creamy and dreamy. This definitely took some work; but that’s not super surprising with a name like deep dish spinach and sun-dried tomato quiche with toasted sesame crust (it takes me almost 5 seconds just to say the name at a reasonable speed). We started at 11pm-ish, and finished at 2:30am (this does include chilling and baking time). This was fine for us, but maybe not for someone who wants quiche immediately. For the crust, whisk the flour, salt and 2 T sesame seeds. Cut in the butter. Whisk the wet ingredients. Add to the flour/butter. Use a fork to bring the dough together. On a lightly floured work surface, dump out the dough. It will be moist and shaggy. Gently knead into a flat disk. Chill. Grease a 10 inch springform pan, then sprinkle the pan with sesame seeds. Roll the dough out on a lightly floured surface to a 15” circle. Press the dough into the bottom of the pan and up the sides. Line the dough with foil, pushing the foil down onto the dough and up and around the sides, then refrigerate for 30 minutes. Bake at 350F for 10-15 minutes or until the crust is just set. Remove the foil. Make the filling. Heat oil in a large skillet. Cook the onion until caramelized. Stir in the garlic, spinach and tomatoes; cook until the spinach is defrosted. Add the herbs. Season with salt and pepper. Cook until no longer wet. Cool, then stir in most of the cheeses. Spoon into the crust. Mix the wet ingredients and nutmeg. Season with salt and pepper. Pour over the spinach. Bake at 350F for 50-55 minutes, adding the rest of the cheese on top at the 30 minute mark. Cool for 20 minutes before cutting. Sprinkle with sesame seeds and flaky salt.